Cool KS: Veranthe Codex – Only 5 days to go! in case yesterday’s and today’s review were not enough of an indicator – there currently is a kickstarter running that closes this week-end, one spearheaded by a couple of thoroughly talented designers, for a setting called Veranthea. So why should you care for yet another fantasy setting? Because the setting makes room for all those fringe things one enjoys without making them required – Psionics, Gunpowder, WuXia etc. – you name it. Beyond that, the setting, whose fluff I’ve had the pleasure to read over the last couple of weeks, is uncommon in that it feels less like a conventional fantasy setting – taking elements from genre-flicks, mythpunk and a definite fantasy-punk style influence, Veranthea may be a high fantasy setting, but it is one that brims with creativity and panache, one that dares to be different. Where else can you see subdued anime influence, play monsters, explore wild west/pulp-crossover underdark and have these components actually make SENSE within the world, be believable? Veranthea is a worthy, cool project that deserves to be funded, so please, if you have a minute, check it out! Here’s the link to the kickstarter! This Genius Guide clocks in at 11 pages, 1 page front cover, 1 page editorial, 1 page SRD, leaving us with 8 pages of content, so let’s take a look, shall we? After one page of introductory fluff setting the scene, we read the first question that may pop into one’s brain -“Do we need more feats?” Unlike many other books, this one is not intended to fill roles in the rules or make some insane combo possible – it is made to provide fun options for the respective characters – and honestly, that’s a good approach. One crucial component of properly judging whether content will see use at my table would be that I require the crunch to properly supplement storytelling. The first feat already points in exactly this direction -Arcane Blood allows sorcerors with damage-dealing daily-use bloodline powers to increase damage-output of said abilities by 2d6 per spell level for the expenditure of a first level or higher spell slot, balancing the increase in raw power with an additional resource-expenditure. This is a nice way to make bloodline abilities relevant at higher levels and increase a character’s focus on them. Receiving feedback to be able to perceive things in the area of a cast spell, even sans line of sight. What about a metamagic spell that does not harm good-aligned creatures unless specifically targeted at them? Another feat allows the character to increase caster level randomly for specific schools of magic depending on the random constellation of the stars of the world. Or take a magus-feat that allows you to use spellcombat with 2-handed weapons, albeit with minor penalties to concentration when casting spells with somatic components. Powerful, but also a particular option that is absent from the base class. I’m not 100% comfortable with making the magus more glass-cannon-y than it already is, but I get the appeal of the feat. The same holds true for the feat that allows monstrous magi to claw, (and later also claw, bite) and cast – which makes for a nasty damage-output. Witches can go for truly devastating combos with a new metamagic feat – Cackle Spells may take +1 spell level, but said spells may be expended via the application of the cackle hex. Ouch! Not all feats like this can be booked on the awesome side -a spellcraft check to deduce knowledge from targets damaged via acid-spells, for example, at least to me feels to meta, too disjointed, Temporarily getting both DR and fire resistance when using cold damage based spells and spell-like abilities. Now the thing that makes this one not easily abused would be the smart decision to couple the mechanics with the dice of cold damage dealt. Making fetishes to slightly increase the potency of your magic also is a cool idea, if one that could have used a more powerful or unique representation – sympathetic magic has quite some potential and the execution of this one, with only a slight increase to DC against the target while being tied to gp-expenditure feels a bit weak for my tastes. Now making non-damage-dealing spells potentially permanent at five levels higher and be treated as a kind of curse is a cool idea – though there’s an issue here – the feat allows potentially for stacking and that can be problematic -while the intention is clearly to make the respective spells into kind of curses, as written, the feat can be used to rather easily and sans restrictions make buffing spells permanent. This feat needs further restrictions. Establishing a link via touch attacks to channel further touch attacks also makes for a cool option, but one I’m pretty sure that can be broken – it is, anyways, a powerful tool, not only for attack, but also for healing and buffing purposes. Another potentially unpleasant beast being “Elemental Alloy”, which allows you to lace spells with the effects of your elemental spell feat, potentially transcending immunities and resistances, requiring the target to be resistant/immune to both. Potentially okay, but the feat does not specify what happens if a target is immune to one and resistant to the other energy type. The same ambivalence extends to immunity to one element and vulnerability to the other – the feat does not explain what happens then. Adding templates on summoned creatures is a cool idea as well, though one a DM allowing the feat should have careful control over – the various templates that can be found out there greatly diversify summons and add a cool dimension, yes, but templates per se aren’t always well-balanced regarding the CR-adjustments. On the one hand, this is definitely a rule-o9f-cool feat, on the other, it requires an enlightened DM-player-relationship, so bear that in mind. Immunity to one’s own fire spells on the other hand, now that is glorious and rather iconic. Temporarily changing magic/alchemical items or devices to suit your needs is another one of the candidates – while extremely iconic and limited by a significant restriction, we here have another one that’s great – if a DM and player agree on limitations. Using spell-trigger items a limited amount of times per day sans requiring spoken words makes for a cool option. Speaking of cool – making healing more efficient in non-combat circumstances makes sense and is mechanically sound. Naming spells and making them more powerful also is one iconic options. What about making single-target AoOs with wands or staves. Potentially opting for average damage with spells also makes for an interesting option. Healing summoned creatures via summon monster, receiving a retributive strike or being able to be able to be revived from the dead by securing your soul in rings also can be achieved herein. The option to take out an eye for magical sight is also cool in its iconography, even if it could use better scaling. The option to treat Spell Mastery-spells as arcane arrays that can be considered micro-lists of spontaneous spells also makes for a cool idea, further enhancing spell selection for arsenals of spells. Making trap-like spells is also a cool feat -but where is the DC for rogues to disarm trap spells? Making excess healing applicable as damage to other targets also makes for an interesting option, mostly thanks to the daily limit. Extra lethal spells versus targets talked into lowering SRs and dual-activating rods also makes for cool ideas. Editing and formatting are very good, I didn’t notice any significant glitches. Layout adheres to a 2-column full-color standard and the pdf comes with thematically fitting stock art. The pdf comes fully bookmarked for your convenience and also extensively hyperlinked. Owen K.C. Stephens delivers a neat array of cool feats that truly enrich storytelling herein – though, admittedly, some of them offer this awesomeness at the expense of mechanics that are less precise than what one usually would see from RGG. Now do NOT get me wrong – the feats in this book are actually rather awesome and do offer a lot of cool options that truly allow for some iconic builds that aren’t supported by the vanilla rules. Still, this pdf, while exceedingly cool, also features some minor balance-hick-ups that keep it from coming as highly recommended as I’d love to do. My final verdict will hence clock in at 3.5 stars, rounded up to 4 for the purpose of this platform. 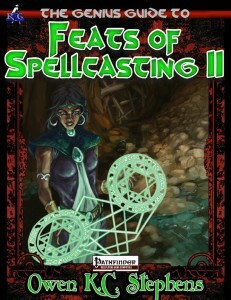 You can get this thematically cool selection of feats here on OBS and here on d20pfsrd.com’s shop. This preview for Rogue Genius Games & Mike Myler’s campaign setting of Veranthea clocks in at 7 pages, 1 page front cover, 1 page editorial/ToC, 1 page advertisement and 1 page SRD, leaving us with 2 pages of FREE content, so let’s take a look! Who is Shojo Matsumoto?Well, once Shojo Matsumoto was a brutal man – a butcher of fellow men born to the streets and poverty…which all changed once he was recruited by His Personage of Golden Fortitude to, over the time, become the commander of the emperor’s ant-spellcaster strikeforce, the Spellthieves. Still wearing the chains of his servitude as a reminder, he is a unique blend of 5 levels bloodrager (untouchable rager) and tetori Monk 4 that may be a superb force, but now also a character specialized in taking foes alive… Whether his newfound allegiance is true or just due to the contained curse ravaging through his body – that’s up for you and your group to decide! Editing and formatting are top-notch, I noticed no significant glitches. LAyout adheres to Vernathea’s glorious 2-column full-color standard and the pdf’s artwork of Shojo is neat. The pdf has no bookmarks, but needs none. 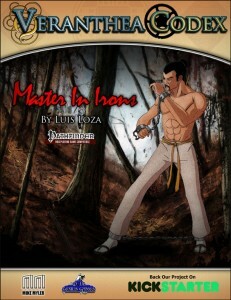 Luis Loza delivers a cool NPC here – and while I am no big fan of any of the hybrid classes in the ACG, this pdf’s NPC makes for an interesting build that many a DM can probably use very well – even if you only want to scavenge the build or the story – this is FREE, so what’s there to complain? Nice build, free of charge, 5 stars + seal of approval. You can get this cool NPC FOR FREE here on OBS! This installment of the Sinking-mini-modules clocks in at 20 pages, 1 page front cover, 1 page SRD, 1 page editorial, 1 page ToC, 2 pages of advertisement, 1 page back cover, leaving us with 13 pages of content, so let’s take a look! Still here? All right! First of all – read the previous module “The Freedom Gambit.” Why? Because this is the immediate successor and the PCs, escorting Blood Senator Vulgrax, are on the run from the city, braving the wilderness – and indeed, after an easy intermezzo, the deadly hunt is on – the notorious Blood Fang is hot on the heels of the PCs and their ally – and if wyvern-riding elite-mercenaries don’t drive the fear down the backs of the PCs, what will? 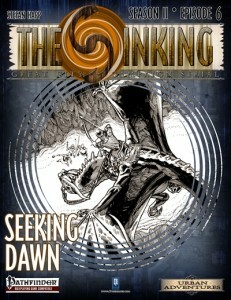 Stefan Happ’s Seeking Dawn is a straightforward, unapologetic action-romp that manages to fit diplomacy, slever terrain and truly iconic locales within a few pages, while still providing the level of in your face action the premise of the module demands – a furious and cool escalation that should have the PCs itch for revenge, and for the low price and thanks to the great production values, well worth 5 stars + seal of approval. You can get this cool, inexpensive module here on OBS! This free preview for Mike Myler’s Veranthea Codex clocks in at 9 pages, 1 page front cover, 1 page editorial/ToC, 2 pages of SRD, 1 page advertisement, leaving us with 4 pages of FREE content, so let’s take a look, shall we? So what is the Betzekorps? On the mechanical side, one could call it a 10-level PrC with full BAB-progression, medium ref-saves, 4+Int skills per level and d8 HD, available only for gnomes and haflings…and one would be rather reductive in such a statement. Why? Because the Betzekorps is an example of good high-fantasy storytelling that makes logical sense. While the PrC’s benefits net massive bonuses to using harnesses and allows the class to create the special water, evasions, defensive rolls, flyby attacks and the like make sure that taking apart foes while flitting around on the battlefield remains a cool option indeed…have I mentioned the flyby-full attack capstone that is not the only thing these guys get at level 10? Editing and formatting are top-notch, I noticed no glitches. Layout adheres to a drop-dead-gorgeous two-column full color standard – Justin Gagen did a great job, which also extends to artist Indi Martin – this is a beautiful pdf. The pdf has no bookmarks, but needs none at this length. 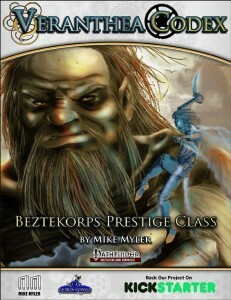 Mike Myler’s Betzekorps is AWESOME. Much more than conventional fantasy, it feels more like fantasy-punk, is a love letter to Attack on Titan AND FREE. You can’t say no to to a good, free product now, can you? Seriously, a cool PrC, iconic materials with cool implications for the world – if you require a reason why Veranthea is different from other settings, why you should give it a chance – this should deliver. My final verdict will clock in at 5 stars + seal of approval – it’s free, awesome and I’m an unabashed Attack on Titan fanboy. Even if you did not lke the anime, though, you should check this out – it’s damn fun and alchemists, tinker-style characters etc. should benefit from the items and materials herein. You can get this FREE pdf here on OBS! The second would be the latest dark fantasy module by TPK Games, Fen of the Five-Fold Maw, which coincidentally will be fully Laying Waste-compatible… and if you need a reason to like TPK Games-modules, I reviewed them all. Thanks for your attention! Next week, I hope to have some more reviews pertaining current kickstarters…see you then! P.s. : If you like me pointing out current KS, please comment. If you don’t like it, I encourage you to do the same. Depending on the feedback, I will continue to post about them or refrain from doing so. This massive tome clocks in at 168 pages, 1 page front cover, 1 page editorial, 2 pages of backer-list, 2 pages of ToC, 1 page SRD, 1 page advertisement, leaving us with 160 pages of content, so let’s take a look! But before we do, full disclosure: After receiving the Beta-version of these rules and thoroughly enjoying them, I was asked to be a stretch-goal for this book and thus have contributed some content to this book. I do not consider my verdict in any way compromised by this, but felt obliged to mention it anyways. The archetypes I contributed are clearly discernible (since the book properly credits its guest authors – which is awesome! ), so judge for yourself. Got that? All right. So the basic question this book poses is one that has haunted me for multiple iterations and roleplaying systems – why are critical hits so boring? Yeah, bonus damage may be nice, but let’s face it – the additional numbers just aren’t that cool. In older systems I essentially scavenged and homebrewed components from e.g. rollmaster, but those brought their own issues. When the critical hit and fumble decks hit shelves, I went for them. They didn’t do the trick for me, being not extensive enough and a tad bit too random for my tastes. Just taking and modifying systems from other rule-sets also proved to be not the best option. Enter Laying Waste. The base system is ridiculously easy to grasp – all crits deal max base damage. There are no more critical confirmation rolls – these have been replaced by so-called severity checks: These are essentially a d20-roll + the the excess amount the attack beat the target’s AC and also fractures in the critical modifier of the weapon and the size of the weapon. Even bonus damage, different size categories etc. are taken into account. What sounds moderately complex in a review’s text is actually exceedingly simple on paper and thanks to the concise examples given. Now additionally, severity checks then result in no additional effect, a light wound effect, a moderate wound effect or a severe wound effect. Some of these wound effects have saves to mitigate – so yes, while you make chop off nose, puncture eyes or even behead foes, they will have to have failed a save to suffer such debilitating effects. Once you have determined the severity of the wound, you roll a d% to check the effect, with each table offering a massive 50 entries of different wounds that makes 150 for piercing, bludgeoning and slashing EACH. While there are some overlaps of wounds between the respective damage types, these are the exception rather than the rule, resulting in the diversity and uniqueness of the remarkable occasions of criting being significantly increased – it’s no longer: “Remember how I dealt 47 damage to the ogre in one stroke!”, but rather “Remember how it took that ogre’s arm clean off?” Yeah. You probably get why prefer systems like this. Now in case you haven’t noticed – this results in a significantly increased gritty-factor and a kind of increased realism that gets rid of an, at least for me, unpleasant abstraction in the rules. Now another part of the effect would be the prevalence of bleed-effects – it never made sense to me that bleed doesn’t stack and for the purposes of this system, it does. Means of recovery and the heal skill also are properly implemented – no longer is the latter a waste of skill points, but rather a nice option to help keep your battered allies together. Now this base system can be further modified rather easily via a couple of optional rules that worked well in my tests. Now, of course one would assume that synergy with e.g. already published feats would become wonky, but since severity replaces the critical confirmation roll, the bonus added can be simply carried over – elegant. Now this book does sport a vast array of new feats to support the system – the table alone covers over 5 pages, just to give you an idea of the scope. If I don’t want to bloat the review worse than Kaer Maga’s bloodmagic practitioners, I’ll have to resort to giving you a general overview, all right? The feats generally interact and expand with the new system – take the very first feat, acrobatic reflexes: Instead of a ref-save, this allows wounds that prompted a ref-save to avoid the wound’s effects via acrobatics. Other feats allow you to treat the base damage (e.g. piericing) as another damage type. Of course, just about all common class/race features can be expanded as well – racial foe/hatred? There’s a feat for it. Better threat range against foes unaware of you? Yep. Increased bleed damage whenever you cause it? Bingo. On a plus-side – shields receive more relevance: With the right shields, you receive a chance to negate the critical hit. Yes. The whole hit. Why do I consider this a good thing? Well, at first, I didn’t. In actual game-play, it did add a level of dynamics, a roller coaster of emotions to the combat: When my Death Knight scored a decapitation against the paladin, who then proceeded to negate the attack, the player was sitting on the edge of his chair. Now some of the feats admittedly are “only” a good idea that could use proper expansion into a full-blown system: Take critical channel – Roll a d20 every time you channel: On a 20, double the effects. While this one won’t break any game and gives the channeling player some of the criting satisfaction, I still maintain that a full-blown system would work better here. I’m also not a fan of adding a second attribute (like e.g. cha) as a modifier to damage, even if it’s only on critical hits, but that’s a personal preference and won’t influence the final verdict. Now Deflect Blow is also an interesting feat – as an immediate action, you may opt to be hit by an attack, but receive DR /- equal to you BAB against the attack. No way to exploit, tax of one feat, action-economy-restriction – this is an example for a damn fine feat. Why? Because it makes combat more dynamic, adds some tactics and can’t be cheesed via items, buffs etc. Opting to increase the threat range at the chance of an increased fumble-rate. Another peculiarity of the feats herein would be that, beyond the weapon damage type finally mattering more, the feats also often require specific weapon qualities to work, lending the respective builds towards a more diverse weapon selection and thus, fighting styles. While by far not all feats herein are winners, the vast majority actually work in rather awesome ways and serve to neatly expand the base system’s impact. Now Laying Waste would not be a massive book on mechanics without new archetypes -a total of 16, each crediting the respective author (and yeah, these include Rachel Venture, John Reyst, James Olchak, Adam Meyers, Clinton J. Boomer (!!!) and yours truly). Now generally, the archetypes are rather high-concept: James Olchak’s Bajquan Imperial Bodyguard, for example, makes for one of the coolest bodyguard archetypes I’ve seen in a while – and while regaining ki by receiving damage can be cheesed with regeneration and fast healing, it is at least slow – still, that particular ability imho requires further restrictions to prevent all-out cheesing. Brian Berg’s sinister Blood Archer, firing arrows clad in virulent poison with bone bows just oozes cool imagery. On the other hand of the spectrum, Rachel Ventura’s woodland snipers bounded to nature spirits, the Dakini, are less sinister, but still damn cool. My Disembowler archetype is all about wielding oversized weapons (and yes, I plainly disregarded the cluster-f*** that is the Titan Mauler FAQ in favor of a simpler solution)…and gaining, at later levels a friggin’ one-man cannon. This barbarian archetype also is all about NASTY severity-effects and may wilder somewhat in the gunslinger’s arsenal. Now some Otakus may start grinning right now – If you haven’t realized it: I made this one as a personal love letter to the character Guts from Kentaro Miura’s legendary dark fantasy Manga-saga Berserk. Conversely, my master of 1000 cuts, a fighter specialist of bleeding criticals actually came, concept-wise from my 2nd edition-days, before the bleeding rules were nerfed to smithereens – with Laying Waste fixing that, I could finally update the cool concept and modernize it. James Olchaks fighting-style analyzing Mockingbird-rogue is cool and Rachel Ventura’s take on the Amazon actually makes a low armor, agile barbarian based on CHA work. Now if you’ve seen any WuXia-movie ever, I probably won’t have to explain the concept of the pressure point master I wrote – Iless damage, better critical effect control would be what to expect here. (On a personal note: Thanks to all the reviewers that explicitly commented how they liked this one!) Adam Meyers also has something rather cool up his sleeve – the head honcho of Drop Dead Studios provides some cool Sneak Attack Substitutions. Now I don’t have to tell you that Clinton J. Boomer’s contributions are high concept and awesome – heavily armored dwarven barbarian? Ninja? Yeah. Brian Berg also provides a more down-to-earth sword master and a mace specialist. James Olchak’s Spiked Gauntlet/Armor-specialist also makes for a neat take on the trope. John Reyst’s Vandals are barbarians all about stealing and destroying. Now it’s only fair in a system of cool critical hits to apply the same thoroughness to critical fumbles -a distinction between melee, ranged and natural critical fumbles covers all the bases for the mundane ways to botch. This part of the system is just as optional and modular as the base system, but also damn cool. Now going even beyond that, Laying Waste takes groups that play with Armor as DR and Called Shots as variant rules into account and provides rather extensive advice on using the systems in conjunction, should you choose to. While I liked both base systems (introduced in Ultimate Combat, if my memory serves right) idea-wise, their execution did not work for my group when I introduced them, but since some groups will like them, kudos! Now I already mentioned the increase in significance the poor heal-skill receives and yes, the rules here are concise as well. Beyond that, magical items and item qualities, a nice piece of short fiction and the fully statted Cr 15 fetchling magus on the cover as an iconic round out the book. Editing and formatting, not the biggest strength of TPK Games, is better here than in any other book they’ve released so far – while minor glitches can be found, their frequency is low enough to not impede one’s enjoyment of the book. Layout adheres to a relatively printer-friendly 2-column b/w standard (with red highlights) and the b/w-art is original, old-school and nice, apart from the full color cover and single pieces here and there. The pdf comes excessively bookmarked and hyperlinked for your convenience. This critical system is AWESOME. There’s no way around it. If I had not considered it great, I wouldn’t have agreed to work on it. Now, quite some time has passed and the system has seen some use and I can wholeheartedly say – it has improved the game. Combat is more dynamic, crits are more memorable – and best of all – the system is ridiculously easy to learn and master, elegant in design and modular: Don’t like the fumbles? Ignore them. Don’t like a feat/archetype? Ignore it. Even better, the system does not require other supplements to be specifically designed for it – each new supplement you buy can easily be made to adhere to Laying Waste’s rules – this system will remain relevant. That being said, I wouldn’t be Endzeitgeist if I had no complaints – some feats and archetypes didn’t blow me away, but that’s all right. A more significant catch would be that this book, by intention, is all about martials and martial crits – alchemical, magical or psionic crits will have to wait for Laying Waste II, which will also be made. So yeah, there’s a gap in the system there, but one that is acknowledged. After several months of playtesting this beast, I can say that neither I, nor my players ever wish to return to the boring, bland default rules. This book may not be perfect, but you can cherry-pick it very well and the general system is elegant and downright genius. 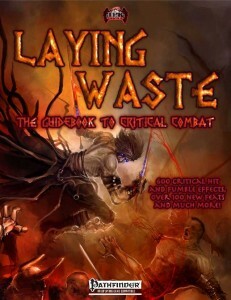 If dark fantasy, horror, scars or just a gritty, more realistic fantasy is what you’re looking for, if crits no longer result in excitement at your table – then you MUST get this. Even if you just want an array of wounds or additional effects for your own critical system, this beast is well worth the fair asking price. My final verdict will take all of these into account, but ultimately reflects one fact: There are few books that see this much use at the table, that so effortlessly increased fun – and while I can’t always play with it (since I do a lot playtesting), it has become a permanent fixture in my main campaign. Now when do we finally get book 2? My final verdict will clock in at 5 stars + seal of approval plus a nomination as a candidate for my best-of 2014. You can get this superb critical hit system here on OBS and here on d20pfsrd.com’s shop! This pdf clocks in at 28 pages, 1 page front cover, 1 page ToC, 1 page SRD, leaving us with 25 pages of content, so let’s take a look, shall we? So what is the Plaguewright all about? Well, basically, we get a 3/4 BAB-progression-class with good fort and will-saves, d8, 4+Int skills per level, proficiency with simple weapons and syringe spears, light and medium armors and shields and when wearing shields with which the character is not proficient, it will decrease action economy efficiency of loading syringes. Now the name Plaguewright may sound awfully negative, though one should be aware that this class, as a pioneer in biology and its application in warfare, can just as well be used for good -so no, not an evil-only class. Plaguewrights compartmentalize these weapons in containers of different sizes that hold the microbe-containers. Plaguewrights begin play with one vessel and receive another vessel at 5th level and every 4 levels thereafter. They also receive 1 vial at 1st level and the class receives +1 vial every level. Their difference is in container-size. A vial can contain enough culture to fuel one syringue, whereas a vessel can contain 1/2 class level +Int-mod uses. The cultures made require a minimum intelligence score of 11+number of filled mutation slots of the given culture. The save-DC for the respective culture varies on the basic strain used. While plaguewright cultures refresh daily, they do not require sleep. Now I mentioned strains – the Plaguewright begins play with 3 strains known and at 2nd level and every even level thereafter, the plaguewright receives an additional strain. Plaguewrights also begin play with 2+ Int-mod mutations and learn an additional mutation every level. Got that? All right! So what type of methodology do these cultures adhere to? Essentially, cultures have 1 mutation slot and increase the amount of mutation slots by +1 at 4th level and every 4th level thereafter. Now here’s the catch – microbes don’t grow on trees. Well, all right, they actually do, but generating cultures actually takes a bit of time. Now since attacking (and delivering) with strains of microbes via syringes requires precision, the class also receives the scaling ignoring of DRs and as a capstones, removal and changing of mutations becomes twice as effective. The class comes with full FCOs that also cover exotic races like puddlings, hobgoblins, kobolds, and the plane-touched aasimar and tieflings. 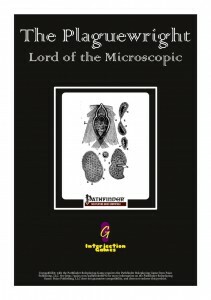 The pdf also includes 10 different feats to further enhance the options available of the plaguewright. Faster mutation-application, increased DCs and additional mutations and strains, improved vial capacities, making hybrid strains and reloading as a substitute for an AoO etc. – quite a nice array of nice options. Strains generally can be grouped in benignant or malignant strains (though one can be categorized as either) and the same holds true for mutations. All of the respective strains and mutations count as supernatural effects and supernatural diseases that bypass immunity to mundane diseases – otherwise, e.g. adding a mutation with the mind-affecting descriptor renders the whole culture mind affecting. The system is relatively easy to grasp. Some strains have cumulative save modifiers that actually increase, durations and symptoms – and some of the mutations are terminal; Essentially, they are the end-game effects and a separate supernatural ability to the respective culture. So what about those strains? Take the Barbaris-strain – a benign bacteria, it provides temporary DR to the target – and duration is an interesting component here – benign strains tend to have their duration measured in an interesting way: The recipient saves every round and upon a failed save, the effect ends, but a maximum duration prevents infinite buffing exploits. Increased temporary hit points, being enabled to temporarily “fly” by making jump-like saunters, getting roid-like str-enhancements. Among the malignant strains, we have those that cause nausea, shortness of breath, confusion -dex-damage-causing, crashing all strains and mutations for painful damage…bleed-inducing elephantitis, a virus that makes the recipient treat all creatures as if they had been subjected to a mirror image-like effect. Higher level malignant strains can induce heart-failure (with a cool mechanic – exhaustion for x rounds, once rounds elapsed > HD, the creature dies), cripple casters, mind-control parasites that make the recipients suicidal and classic flesh-eating bacteria – there are quite a few rather nasty and versatile options. Of course, as you could probably glean from these, Interjection Games’ unique effects can be found herein as well – what about e.g. a damage-dealing strain that grows a nodule of skinsack, which can then be harvested as a rather effect healing potion? Yucky, yes, but also rather cool! On another level, it should be noted that the respective strains sometimes modify the amount of mutations that can be applied to them for further concerns in the customization department. Now you should remember – these examples only covered a selection of the base strains – so what can mutations accomplish? Well – for example, they can affect creatures adjacent to those infected by the syringe at the cost of mutations applied, there are mutations that can decrease the amount of AoOs the target can perform, those that bypass even immunities to supernatural diseases and negative conditions, susceptibilities, an euphoria-inducing bliss (which translates to temporary hit points) – all of these modifications are fun to play with, but where things get REALLY nasty would be with ones that end in a terminal cloud that may infect adjacent targets – crafting a micro-epidemic of effects may actually work out for Plaguewrights that handle their craft well. Of course, similar synergy effects might also be achieved for buffing strains, though it should be noted that these imho benefit more from symptoms – when e.g. your infected ally not only benefits from the primary effects of the strain, but also kicks off with healed attribute damage? Or a fast healing added to the effect? Chances to ignore precision damage? The smart combination of a basic strain, symptoms, regular mutations and terminal boosts to e.g. atk can make for rather interesting effects and the same holds true for the possible combinations of offensive strains. Now I can see the central question – all fort-save based? Well, it’s my pleasure to tell you that there are mutations to make the saves will instead. Editing and formatting are very good, I didn’t notice any significant glitches. Layout adheres to Interjection Games’ 2-column b/w-standard and the pdf’s artworks are thematically-fitting stock art. The pdf comes sans bookmarks, which is a slight comfort detriment. Bradley Crouch’s Plaguewright is a very interesting concept – a debuff-warrior kind of akin to the glorious Maestro; I.e., a highly-customizable class that allows the player to tailor-make the buffs and debuffs of the given culture to make truly unique effects. Unlike more common options of buffing/debuffing, the sheer amount of customization and daily uses and the option to combine, realign etc. so many components makes optimizing the class interesting and allows for quite some versatility to make the right tools, for the right job. The respective strains and mutations offer for a neat array of fun options that should allow the player hours of fun in making new and unique tools to vanquish foes. Both strains and mutations are easy groups of abilities to expand for the enterprising DM (and potential future supplements, should there be any) and Interjection Games’ trademark unique abilities, none of which just lamely duplicate established spells, just add a piece of icing on the cake. Now not all is perfect here, though – the pdf could have been more precise regarding the mechanics of growing cultures with applied mutations and costs for applying syringes to other weapons (with hardness for sundering etc.) would have made this pdf even better, as would have bookmarks. These nagging points out of the way, this should not be deemed a significant detriment – the Plaguewright is still a glorious, unique class with a significant array of innovative options that, most of all, is a unique playing experience – hence, in spite of the minor flaws, this is well worth a final verdict of 4.5 stars, rounded up to 5. If you want mastermind Bradley Crouch to design class-options (or even PrCs/archetypes!) for you – you might wish to check out the Strange Magic Kickstarter that expands some of the coolest magic systems currently available for Pathfinder – it’s in the final hours! Here’s the link to the KS! This pdf clocks in at 18 pages, 1 page front cover, 1 page ToC, 1 page SRD, leaving us with 15 pages of content, so let’s take a look! So what is this pdf all about? well, first of all, it’s about being against the magic item Christmas tree-syndrome – and about making magic items feel more magical. These items actually increase in power over the levels of the wielder. Scalars detect as all schools of magic at once and, if required, treat their CL as = HD of the wielder. Each scalar uses a body slot -close proximity is required for the peculiar attunement these items require. Scalars attune themselves to a master and maintain a stubborn loyalty to function only for this respective individual – until a lot of time has elapsed. Now to maintain the allegiance of a scalar, only casual contact is required. As you can imagine, actually using these items if you’re not the master turns out to be rather difficult. 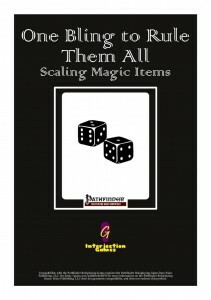 – properly “hacking” a scalar requires quite some mastery in using magic items – and the process is actually explained in a rather smart way, providing a great explanation that actually makes sense. Auras et al also are provided – generally, scalars receive 2 Level 1 abilities, 2 from the level 5 list, 2 from the level 10 list, 1 from the level 15 list and 1 from the level 20 list. Oh yeah, scalars are jealous, so no multiple items. Now the grand thing here is that this toolkit thus allows for relatively easy modification. However, that is not where scalars end – upon attunement, a master receives ranks to use with the scalars, equal to the amount of HDs of the respective master. The ability lines tend to have a required array of ranks – to e.g. unlock an ability that requires 4 ranks means that other abilities require a total of 4 ranks invested in other abilities. The abilities of scalars, unless otherwise noted, do not provoke attacks of opportunity. Now scalars change the dichotomies of a given campaign’s magic item-density and hence, they do come with an improved WBL-table that takes their impact on a group’s power-level into account…and checking this one took ages, but the table actually is sound and should result in no change of power-level – which is exceedingly awesome for especially balance-conscious groups. Now introductions of new items/systems would be solid on the value of crunch alone, but thankfully, some cool, fluffy suggested origins for the genesis of scalars help provide DMs with inspiration in that department as well. Now the base system out of the way, let’s take a look at the abilities, shall we? There are offensive and defensive abilities, those that are constant and some that have a limited amount of uses per day – but it’ll be easier to grasp if I just mention examples – Arcane Bulwark, for example: this level 1 ability nets you SR 5 +number of ranks invested. Or what about an ability that increases the amount of HD of undead a necromancer can control at a given time depending on the amount of ranks invested?Cones and lines as draconic breath weapons, increased skill prowess or movement rates, being hard to swallow, increased carrying capacities – the effects are diverse and interesting and yes, winds that impede ranged attacks – the respective abilities do provide interesting, nice options that thankfully do not just rethread old effects. The level 5 abilities become even more interesting – take alchemical ammunition: This one actually nets you a pool of points you can use to supplement the power of the respective base items. Essentially, the points of this ability allow the wielder of the scalar to imbue ammunition spontaneously with the effects of alchemical items. Or what about being able to cook creatures slain for bonuses? Even relatively boring abilities tend to come with an interesting twist – swim bonus? May be nice. But how cool is actually getting a proper swim speed once you’ve invested enough ranks in the ability? Yeah, that’s what I’m talking about. What about wildering among revelations? Hexes? In a neat twist, these scalars allow not only the proper codifying of core abilities, they also provide support regarding the more uncommon class options. Of course, 1/day rerolls with luck bonuses equal to invested ranks, regenerating poison, ooze alliance…the abilities are cool. And some actually made me grin – take DR against traps, aptly named “Barbarian Trapfinding” – or what about 1/day per rank halving environmental damage. Spellcasters can have elemental energy-spells and effects enhanced. And yes, better escape velocity can also be achieved. Editing and formatting is very good, I noticed no significant glitches. Layout adheres to Interjection Games 2-column b/w-standard and the art is thematically fitting stock. The pdf comes sans bookmarks at this length, which is a slight comfort detriment. Bradley Crouch offers us a great system here – one that provides some cool, unique benefits, customization options for the respective players to enjoy – so what’s not to like? Indeed, the help for DMs regarding WBL, the way the benefits scale – all of these conspire to make scalars a unique, easy to grasp system of nice choices that should not unhinge any game, while at the same time fighting the magical supermarket syndrome – and it involves the players to an extent absent in more mainstream magical items! Over all, a great, modular system that can be expanded easily by just about any DM and which most certainly would benefit from future expansions, whether made for a given home-group or in the guise of additional pdfs. 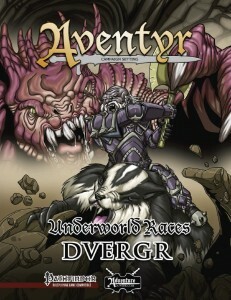 Over all, a great pdf well worth of 5 stars + seal of approval. You can get these cool items here on OBS! Want to have master Crouch design your very own alternate class, PrC or the like? Well, he is currently running a kickstarter and you can actually get exactly that! So check out Strange Magic here!